Nick Vaccaro holds up an image of a young boy holding a small American flag. A young girl lies with a favorite doll in a postmortem photograph. 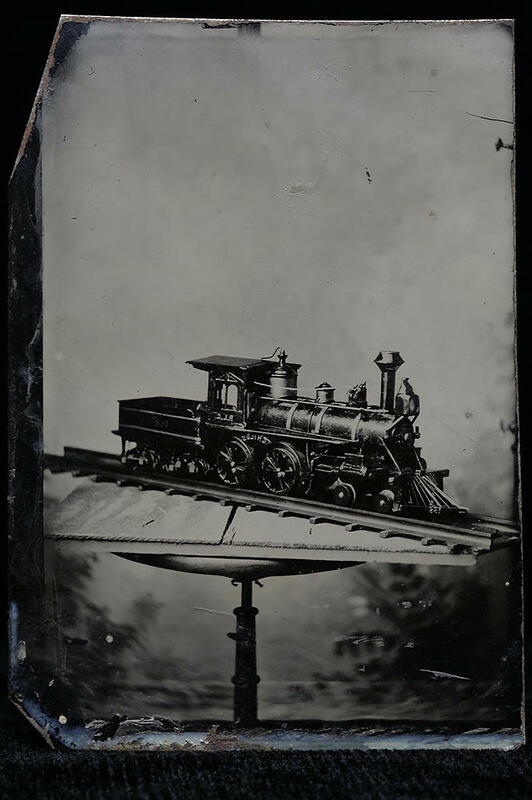 A tintype still life of a child's train. 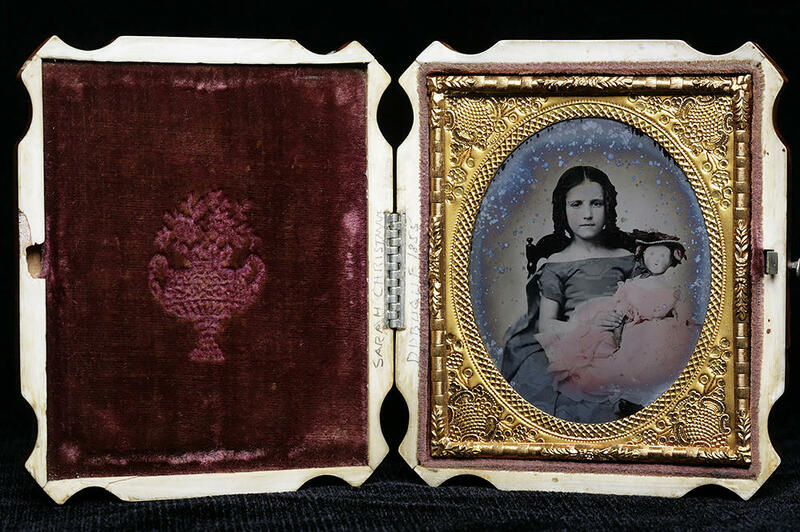 A hand-colored ambrotype of a girl with a doll in a pink dress. An ambrotype is a positive photograph on glass. Dobbins arranges a box of Nick Vaccaro's private collection of photographs on loan to the museum. 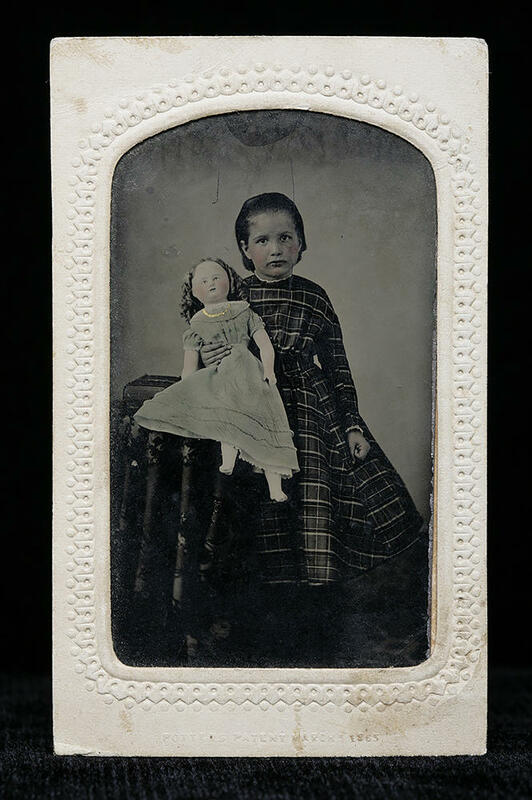 A girl displays a doll in a hand-colored tintype. Dobbins and assistant curatorial assistant Erica Gilliland work with images to prepare for the museum's exhibit in October. Ghostly, metallic-hued faces stare out from century-old photographs. They neatly line the walls on narrow shelves in Nick Vaccaro’s home office in Lawrence, Kansas. “Let me get this out of the way,” said Vaccaro, as he opened the door of a lighted display and reached in for a small leather case. Inside, there’s a tintype: an innovation from the 1860s that brought photography to the masses. "It's a little boy. He’s in a complete Civil War uniform that his mom has made him. He’s got the bedroll and a backpack on, he's got like a powder horn and a small rifle," described Vaccaro, and he turned the photo over in his hands. "Someone has written in cursive behind the image, 'Charlie Gray. This was taken during the Civil War. His mother made him this little suit and he spent his time playing soldier.'" 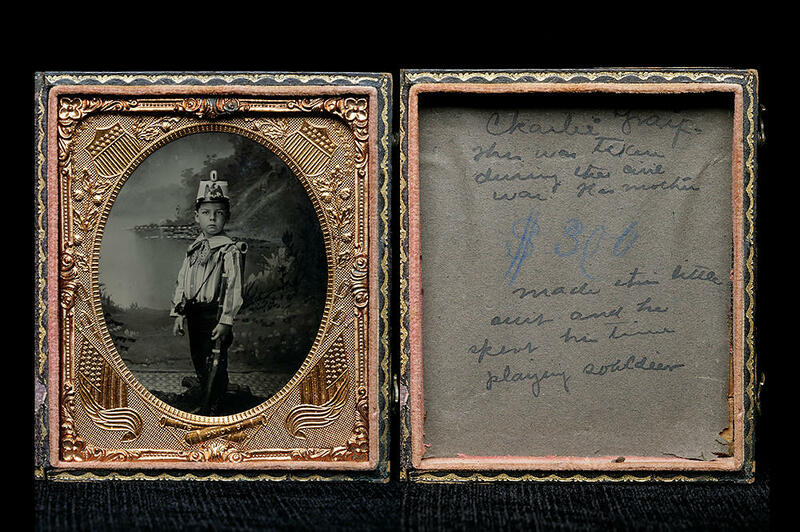 A written message behind a tintype tells the story of Charlie Gray who enjoyed playing soldier in a uniform his mother made for him. Images like this one intrigue Vaccaro, who says he revels in the many layers of history contained within a very small frame. "I’ve told people I’m an antique dealer and collector, but I really feel like an antique historian and collector of history," he said. 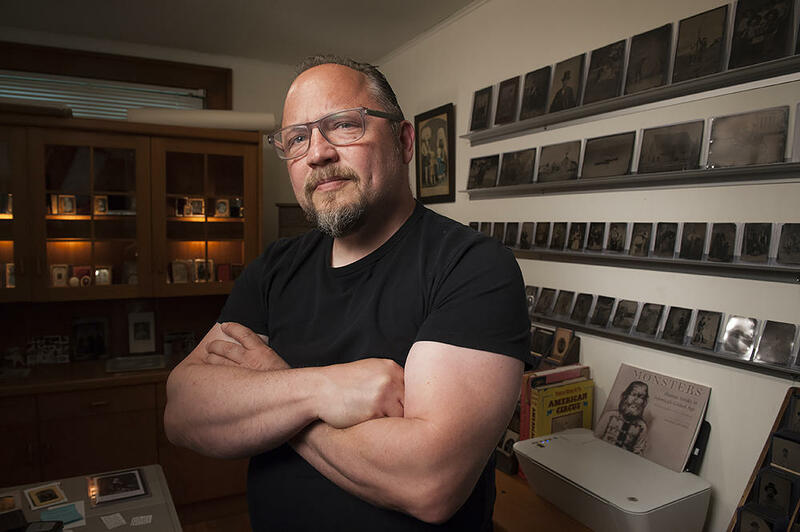 "There’s so much history behind many of the images I’ve collected and I guess that’s the new passion I have is collecting parts of American history." Before turning to collecting, Vaccaro spent 20 years as a photographer in New York City. But about five years ago, he says he was stopped in his tracks by an old photograph of a little girl. 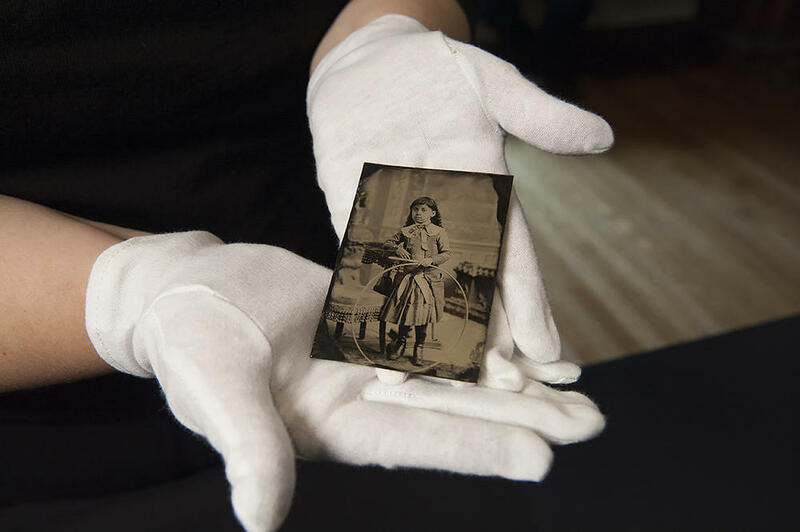 "It was just a daguerreotype, really beautiful," he recalled, "of a young girl wearing a bonnet and I just thought it is the most amazing photograph and there’s got to be more of those out there and I want to find them and I want to collect them." Vaccaro holds the first image in his collection -- the photograph that set him on his journey. Vaccaro now collects full-time, finding a balance between buying and selling. 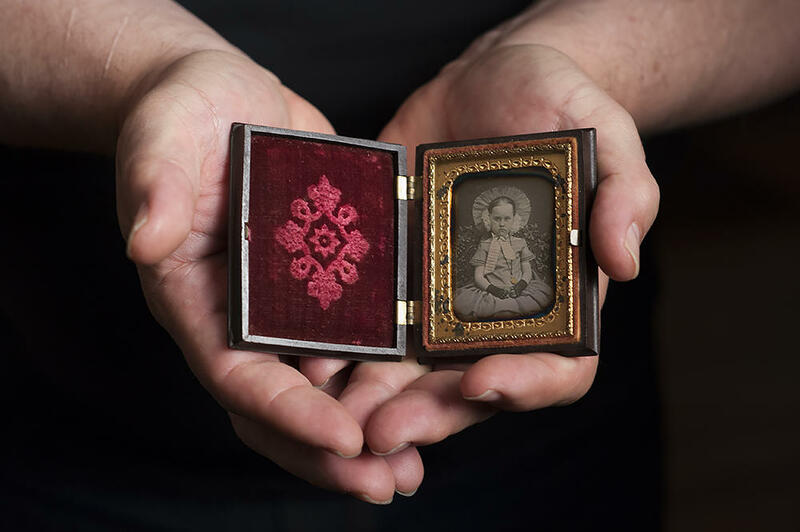 His personal collection numbers in the thousands — with a focus on Victorian-era children and their toys. Two of these photographs are particularly poignant — or disturbing. 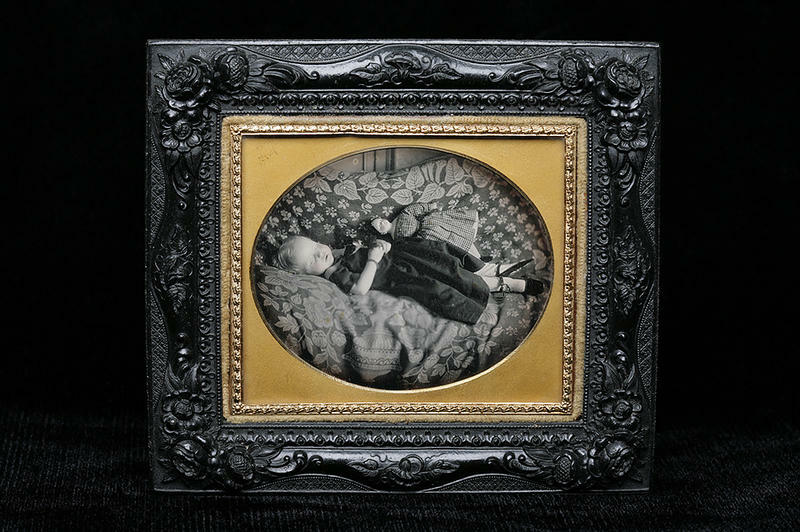 The 19th century’s high rate of infant mortality led to taking photographs of children after their deaths. It was a common practice, although it provides an unsettling record. In one of Vaccaro's daguerreotypes, a young girl is pictured reclining on a sofa with a doll. "And probably her favorite doll has been placed at her death side," he says. "She’s holding a little flower in her hands and she’s obviously been placed in such a position as to immortalize her. I think that’s one thing about photography. It’s a form of immortalization." Nick Vaccaro among his collection of early photography in Lawrence, Kansas. Vaccaro thought there might be a greater interest in the work he’d collected so he began reaching out to area museums. 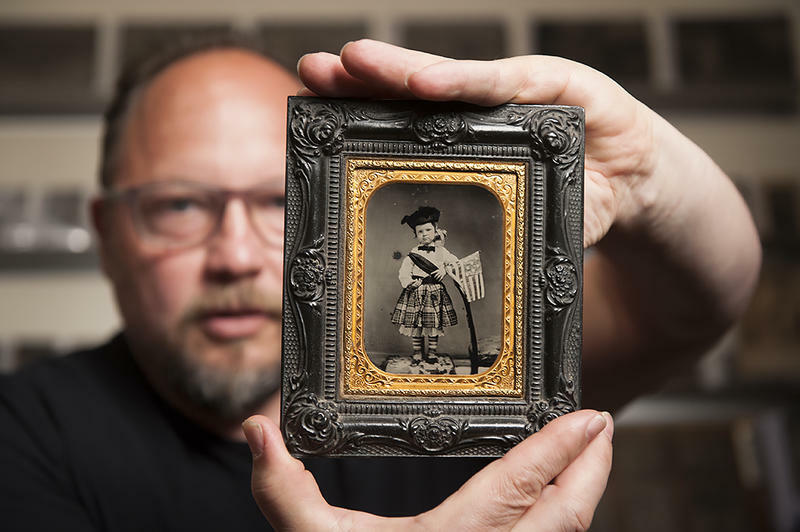 These photographs of children with toys piqued the interest of curators at The National Museum of Toys and Miniatures in Kansas City, Missouri. The works will be on display, starting October 8, in the exhibition, Forever Young: Victorian Photographs of Children and Their Toys. Curatorial Assistant Erica Gilliland wore white gloves on a Tuesday afternoon at the museum, as she pushed a media cart into an elevator. Archival boxes of more than a hundred photographs — on loan from Vaccaro — were tucked in amid layers of protective tissue. Gilliland said some of these photographs might be the only ones taken in childhood. "The fact that it's such a small, intimate thing just kind of brings you back to, 'Oh, well, I could be like their mother sitting and holding this.' Or when we display them, it’s like this could have been on their mantelpiece,” she said. “Little bit of a tight fit in there. I’m going to get this one out real quick,” curator Kristie Dobbins said. 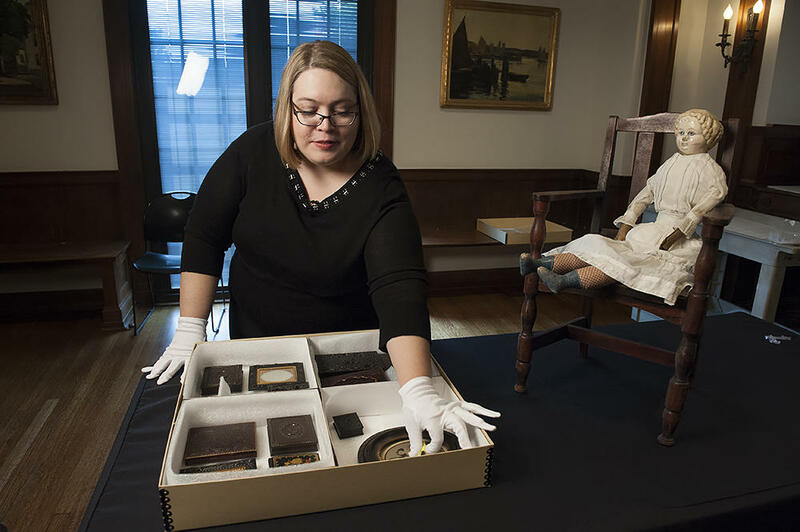 She carefully removed a rare tintype from a padded box. It’s a picture of an African-American girl holding a wooden hoop and stick, a childhood game popular in the 1800s. Kristie Dobbins, a curator at the National Museum of Toys and Miniatures cradles a rare image of an African-American girl with a wooden hoop. Dobbins said that these photographs, on display at the museum in October, will add a layer of meaning to the objects in the museum’s own collection. "And we're really trying to, in this exhibition, make you think about what was meaningful to children," she said. "What was Victorian childhood like? What did these children experience? They certainly didn’t have the number of toys that we have today and what they did have is very special to them." “Here’s number 88,” called out Gilliland as she handed a tintype to Dobbins. They carefully packed away collector and dealer Nick Vaccaro’s photographs for now. 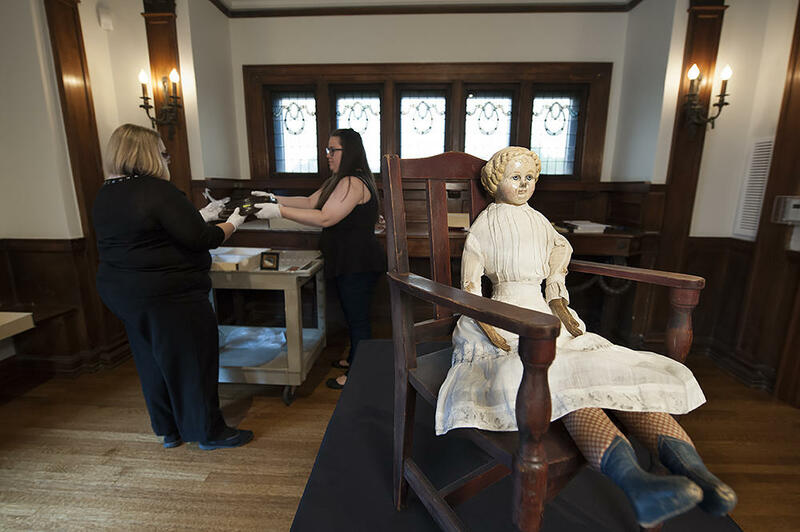 Dobbins said she hopes these images will give museum visitors an insight into toys and the Victorian-era children who loved them. 'Forever Young: Victorian Photographs of Children and Their Toys,' October 8, 2016 - January 15, 2017, at The National Museum of Toy and Miniatures, 5235 Oak Street, Kansas City, Missouri. 816-235-8000.